Thanks to inventory corrections, trade tensions, soft smartphone demand and several other issues, expectations are generally low as several major chip developers and equipment makers get set to report earnings this week. Intel (INTC - Get Report) , Texas Instruments (TXN - Get Report) , Xilinx (XLNX - Get Report) and STMicroelectronics (STM - Get Report) are all reporting this week. So are chip equipment makers ASML (ASML - Get Report) and Lam Research (LRCX - Get Report) , memory giant SK Hynix (HXSCL and hard drive and flash memory giant Western Digital (WDC - Get Report) . Here's a look at some of the main things investors should keep an eye on as their reports arrive, as well as a run-down of analyst sales and earnings expectations for each company. Following a lengthy period of strong demand, a number of chip developers have reported seeing customers pare back their inventories amid macro and trade concerns. In addition to inventory corrections, softening Chinese car demand and weaker global smartphone demand are near-term headwinds for chip suppliers. TI and STMicro are both major automotive chip suppliers, and each also has a measure of smartphone exposure, including to Apple's (AAPL - Get Report) iPhone. There are signs that cloud giants are slowing their data center hardware and chip spending, after having spent aggressively during much of 2018. Spending could pick up again during the back half of 2019, but some near-term choppiness is likely. Intel's commentary about revenue growth expectations for its Data Center Group (DCG), which supplies the lion's share of server CPUs used by cloud giants, is worth paying close attention to. This has been a bright spot lately, as capital spending on mobile infrastructure equipment (depressed for some time) starts to pick up ahead of major 5G network rollouts. TI and Xilinx are both major base station chip suppliers. It goes without saying that the DRAM and NAND flash markets are weak right now. Naturally, memory makers are responding by slashing their capex, with the hope that lower supply growth will let DRAM and NAND's supply/demand balances stabilize relatively soon. Lam, ASML, Hynix and Western Digital's earnings calls should provide additional color on how quickly memory capex is dropping. 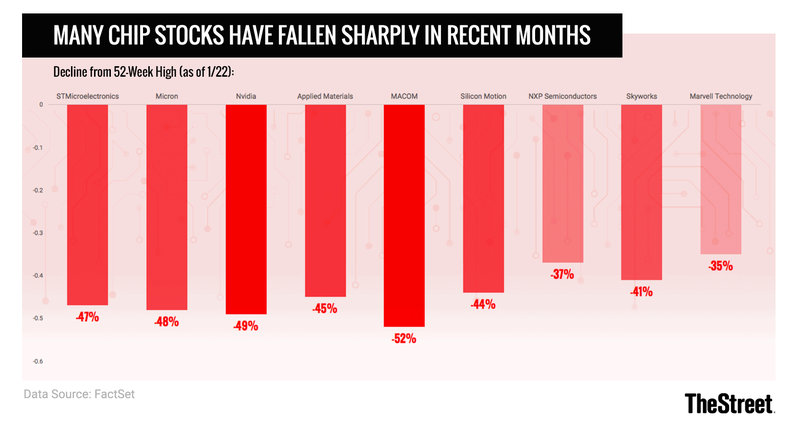 DRAM appears to have an easier path to stabilization, given that the industry is seeing lower supply growth and is largely consolidated around three major players (Samsung (SSNLF , Hynix and Micron (MU - Get Report) ). When They Report: Intel's Q4 report arrives after the bell on Thursday. An earnings call is set for 5 P.M. Eastern Time (ET). Quarterly Estimates: The consensus among analysts polled by FactSet is for Q4 revenue of $19.02 billion (up 12% annually) and non-GAAP EPS of $1.22. Expected Guidance: Intel provides quarterly and full-year sales and EPS guidance in its reports. The consensus is for Q1 revenue of $17.31 billion (up 8%) and EPS of $1.01, and for 2019 revenue of $73.19 billion (up 3%) and EPS of $4.53. When They Report: TI's Q4 report arrives after the bell on Wednesday. An earnings call is set for 4:30 P.M. ET. Quarterly Estimates: The consensus is for Q4 revenue of $3.75 billion (roughly flat annually) and GAAP EPS of $1.24. Expected Guidance: TI provides quarterly sales and EPS guidance in its report. The consensus is for Q1 revenue of $3.6 billion (down 5%) and EPS of $1.20. When They Report: Xilinx's December quarter (fiscal third quarter) report arrives after the bell on Wednesday. An earnings call is set for 5 P.M. ET. Quarterly Estimates: The consensus is for December quarter revenue of $770 million (up 22% annually) and GAAP EPS of $0.85. When They Report: STMicro's Q4 report arrives on Thursday morning. An earnings call is set for 3 A.M. ET at STMicro's Swiss headquarters. Quarterly Estimates: The consensus is for Q4 revenue of $2.63 billion (up 18% annually) and IFRS EPS of $0.40. Expected Guidance: STMicro provides quarterly sales guidance in its report. The consensus is for Q1 revenue of $2.32 billion (up 4%). When They Report: ASML's Q4 report arrives on Wednesday morning. An earnings call is set for 1 A.M. ET from ASML's Dutch headquarters. Quarterly Estimates: The consensus is for Q4 revenue of €2.99 billion (up 17% annually and equal to $3.39 billion) and IFRS EPS of €1.79 ($2.04). Expected Guidance: ASML provides quarterly sales guidance in its report. The consensus is for Q1 revenue of €2.74 billion (up 20% and equal to $3.12 billion). When They Report: Lam's December quarter (fiscal second quarter) report arrives after the bell on Wednesday. An earnings call is set for 5 P.M. ET. Quarterly Estimates: The consensus is for December quarter revenue of $2.5 billion (down 3% annually) and non-GAAP EPS of $3.66. Expected Guidance: Lam provides quarterly sales and EPS guidance in its report. The consensus is for March quarter revenue of $2.46 billion (down 15%) and EPS of $3.36. When They Report: Hynix's Q4 report arrives on Wednesday evening. An earnings call is set for 7 P.M. ET at Hynix's South Korean headquarters. Quarterly Estimates: The consensus is for Q4 revenue of 10.26 trillion won (up 14% annually and equal to $9.1 billion) and net income of 3.8 trillion won (equal to $3.4 billion). Expected Guidance: Hynix doesn't provide formal sales or earnings guidance, but does provide commentary about sales trends. The Q1 consensus is for Hynix's revenue to be down 5% annually to 8.3 trillion won ($7.4 billion). When They Report: Western's December quarter (fiscal second quarter) report arrives after the bell on Thursday. An earnings call is set for 5:30 P.M. ET. Quarterly Estimates: The consensus is for revenue of $4.26 billion (down 20% annually) and non-GAAP EPS of $1.50. Expected Guidance: Western provides quarterly sales and EPS guidance on its earnings call. The consensus is for March quarter revenue of $3.91 billion (down 22%) and EPS of $1.00.